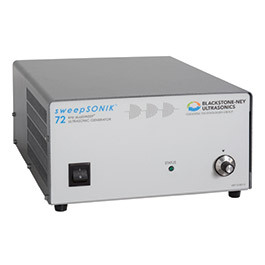 The multiSONIK® 3 generator, featuring Blackstone~NEY Ultrasonics' patented dualSWEEP® and upSWEEP® technology, can operate at frequencies of 40, 72, and 104 kHz. 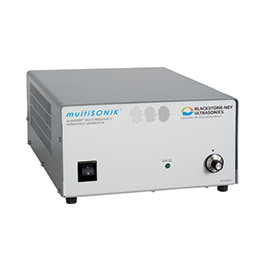 The multiSONIK®2 generator, featuring Blackstone~NEY Ultrasonics' patented dualSWEEP technology, can operate at frequencies of 40, 80, 120, 140, 170, 220 and 270 kHz. This new, advanced technology refacilitates sub-micron particle removal in the critical cleaning of microelectronics, flat panel displays, disk drive components and assemblies, optics, semiconductors, medical devices and more. The multiSONIK® technology permits the exposure of components to a selectable or continually changing array of application-specific ultrasonic cleaning frequencies from a single generator to optimize precision cleaning.